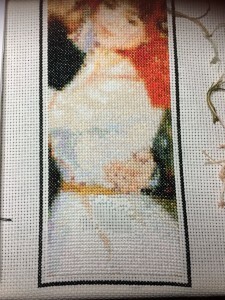 Again – purchased the pattern as a download from ClicknStitch. The original was designed to be a 2×6 ” bookmark on 22 cloth. Failing at that particular bit of fine work as I appreciate both my eyes and the singular lack of usefulness of such a small object – this Cross stitch will be a bit larger. It was chosen by the Eldest. I had something else in mind which she voted down as too large to eve be displayed. The end negotiation is that 44×132 on Aida 11 will give her 4 x 12 which is a more than reasonable size for one of a number of items in a wall display. 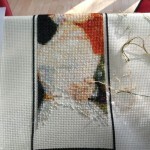 Progress is in the gallery below. I started with some fabric on hand, then tossed it in favor of new. The fold had probably been there for a decade or two and really wanted to impact the design. For as many hours as something takes – saving $3US didn’t seem all that smart. I did wind up picking out a part of her dress and the man’s hand the first time through and redoing.